Felicantonio Cardegna first appears at Painesville, Lake County, Ohio, in 1906. When he immigrated to the United States Painesville, Ohio, was his destination, he was eight years old. Feliceantonio arrived in Painesville with his mother, Maria Orazia Gentile, and siblings, Maria Cardegna and Giovanni Cardegna. In America, Felicantonio Cardegna was known Felice A. Cardina. Felicantonio Cardegna, son of Michele Arcangelo Cardegna and Maria Orazia Gentile, was born on April 26, 1898, at Frosolone, Isernia Province, Molise, Italy. Felicantonio married Livia Sferra, daughter of Francesco Sferra and Angelina Conti, on June 6, 1936, at Peninsula, Summit County, Ohio. Livia Sferra was born at Carovilli, Isernia Province, Molise, Italy. Felicantonio Cardegna died on March 9, 1978, at his home, 785 Storr Street, Painesville, Lake County, Ohio. His body was interred at St. Mary Cemetery, Painesville Township, Lake County, Ohio. Felicantonio Cardegna immigrated to the United States on May 31, 1906, at age 8, travelling to Painesville, Lake County, Ohio. Felicantonio’s family was joining the family’s father, Michele Arcangelo Cardegna, in Painesville. The family arrived in the United States at the Port of New York City aboard the ship SS Gera. Felicantonio Cardegna was enumerated for the 1910 Census of the United States, on April 23, 1910, living at Henry Street, Painesville, Lake County, Ohio, as a son of Michele Arcangelo Cardegna. Felicantonio Cardegna was enumerated as Felix Cardina. Felicantonio Cardegna registered for the World War I Draft on September 12, 1918. He was living at 131 Storrs Street, Painesville, Lake County, Ohio. Felicantonio was employed as a pipefitter for the B&O Railroad in Painesville. Felicantonio Cardegna was enumerated for the 1920 Census of the United States, on January 13, 1920, living at 131 Storrs Street, Painesville, Lake County, Ohio, as a son of Michele Arcangelo Cardegna. Felicantonio Cardegna was enumerated as Felix Cardina. Felicantonio Cardegna was enumerated for the 1930 Census of the United States, on April 11, 1930, living at 485 Storrs Street, Painesville City, Lake County, Ohio, as a son of Michele Arcangelo Cardegna. Felicantonio Cardegna was enumerated as Phillip Cardina. Felicantonio Cardegna was enumerated for the 1940 Census of the United States, on April 9, 1940, living at 483 Storrs Street, Painesville, Lake County, Ohio, as a son of Michele Arcangelo Cardegna. Felicantonio Cardegna was enumerated as Felix A. Cardina. 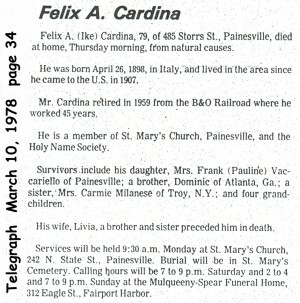 Felix Anthony Cardina became a citizen of the United States in 1944. Felix resided at 485 Storrs Street, Painesville, Lake County, Ohio, when he was naturalized. Felicantonio Cardegna was widowed by the death of his wife, Livia Sferra, on July 2, 1948, at Painesville, Lake County, Ohio. Mr. Cardina retired in 1959 from the B&O Railroad Company where he worked for 45 years. 1. Pauline Cardina was born on September 29, 1937, at Ohio. Pauline was married to Frank Vaccariello.